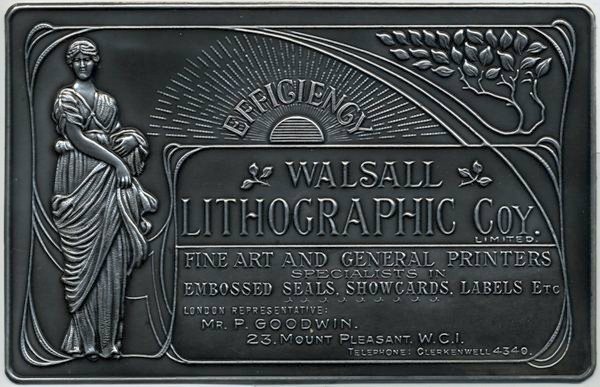 Summary: Three small metcraft plaques advertising Walsall Lithographic Company. 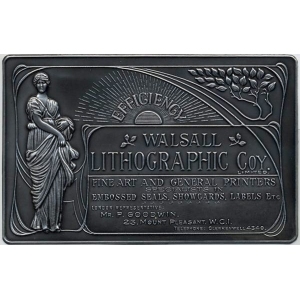 Description: The plaques are gunmetal silver in colour, and rectangular with rounded corners. They are embossed with an Art Nouveau style design, which incorporates a woman wearing an Ancient Greek-style chiton standing on the left, the word "Efficency" around a rising sun in the centre, and stylised leaves on a branch on the right. In the bottom right corner is the company information: "Walsall Lithographic Coy. Limited, Fine Art And General Printers, Specialists In Embossed Seals, Showcards, Labels, Etc, London Representative: Mr P. Goodwin, 23 Mount Pleasant W.C.1, Telephone: Clerkenwell 4340".